Free Printable Bible Easter Trivia Quiz. Free Printable Bible Easter Trivia Game to have fun in March at Easter celebration. Let’s find out how much you know about Easter. Try to answer this easy trivia about the Passover, Triumphal Entry, pieces of silver, Apostle Peter denial, Jesus robe color, who carried the cross for Christ?, tomb, days He remain before ascension, and more from Easter Day. The participant with most correct answers wins. 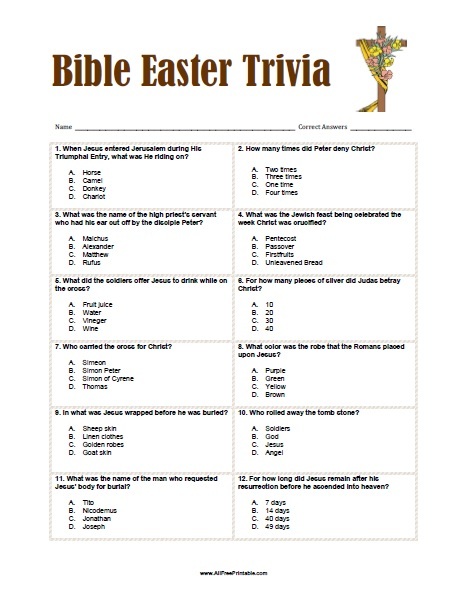 The easy game includes 12 Bible Easter trivia questions and the answers sheet on page 2 (answers in bold). Click the link below to download or print the Bible Easter Trivia Game now in PDF format. Have fun at the Easter Day Party with this free printable trivia quiz game!